I've had chocolate on my mind, and Fudgy Black Bean Brownies hit the spot. It's a bad habit but there's no way I'm willing to give it up! I've seen different versions of black bean cakes, and brownies all over the internet, but the two biggest problems I had with the recipes I came across was either they had barely any black beans, or all black beans, but the texture didn't look quite as appealing. Most recipe's called for about 2/3 to 1 cup sugar more then what I used. So last night in my brownie craving state I decided I was going to come up with a black bean brownie recipe with more beans but a traditional fudgy brownie texture and to try and reduce the sugar down. Let me tell you these are fabulously chocolaty and fudgy! Score! I think the first bite I might have been able to taste a hint of the black beans but by the second I really couldn't tell. Colt and the kids said these are some of the best brownies ever. When I told them I loaded them with black beans for protein, and fiber, Colt asked,"Are you pulling my leg?" He said he really couldn't tell so the black bean taste in the first bite might be all in my head. I am so very critical of the recipes I make, and pass on to you, because I know these are being fed to your husbands, wives, kids, families, and friends. 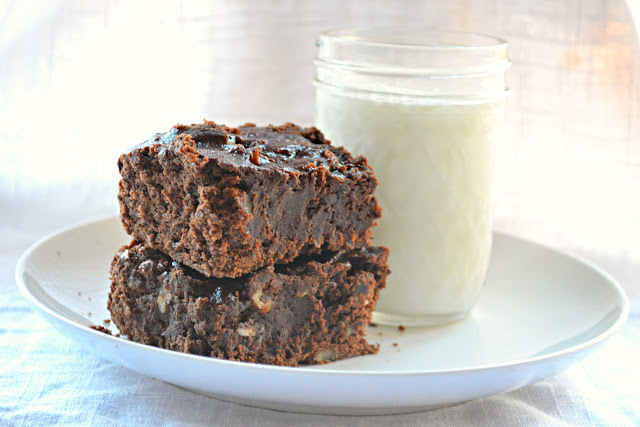 Now go makes some fabulously Fudgy Black Bean Brownies! Grease a 9"x 13" pan with butter. Dust with cocoa powder. Your pan will look like this. Set aside. In a food processor or a powerful blender puree black beans until smooth. Scrape the sides of the bowl as needed to make sure all beans are smooth. Fit a large heat safe bowl over a pan of boiling water. Add pureed black beans, butter and chocolate chips. Stir with a whisk until butter and chocolate are melted and smooth. Be careful of the bowl since it will become hot! It will look like this. Remove from heat. Stir in brown sugar until smooth. Add eggs 1 at a time. Mixing until fully combined until all 4 eggs have been added. In a large bowl add flour, cocoa powder, baking powder and sea salt. Mix until combined. Pour melted chocolate/black bean mixture into dry ingredients and stir just until combined. Add nuts and additional chocolate chips and pour into prepared pan. I forgot to take a picture I guess so well will just pretend. Smooth the top of brownies using a spatula and bake for 30 minutes. 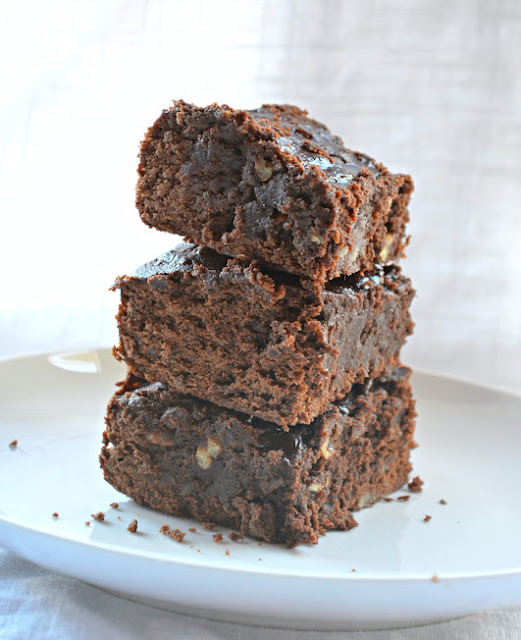 Fudgy Black Bean Brownies from Serena Bakes Simply From Scratch. Grease a 9"x 13" pan with butter, and dust with cocoa powder. In a food processor or a powerful blender puree black beans until smooth, scraping the sides of bowl as needed. Fit a large heat safe bowl over a pan of boiling water. Add pureed black beans, butter, and 1 1/2 cups chocolate chips. Stir with a whisk until butter and chocolate are melted and smooth. Be careful of the bowl since it will become hot! Remove from heat. Stir brown sugar, and vanilla into chocolate mixture until smooth. Add eggs 1 at a time. Mixing thoroughly between additions until all 4 eggs have been added. In a large bowl combine flour, cocoa powder, baking powder and sea salt. Mix until combine. Add chocolate mixture into flour mixture, and stir, until just combined. Stir in nuts, and chocolate chips, if desired. Pour into prepared baking pan, and smooth the top of brownies using a spatula. Bake brownies for 30 minutes. The might appear under done but will continue to bake in the pan after removed from oven. I was looking at this recipe of black bean brownies for long time, never tried. You made me drooling sure I will try this. I've never heard of black beans in brownies. This is interesting and it does look very inviting. I wish we were related! I would always suggest holiday and birthday dinners to be at your home. :) Looks so yummy! My husband and I were just talking yesterday about trying to make good tasting black bean brownies. .. we'll be trying these soon! I just finished making these a few hours ago. I followed the recipe exactly. My kids and husband didn't like them at all. My four year old actually asked if he could just have the Fiber One brownies in the pantry. Ahhh! After all this work, I was surprised at their reaction. No one knew they had beans in them either. That was my little secret! The large amount of cocoa in the recipe and dusting the pan with cocoa makes them have a very bitter flavor. This flavor is very different from most brownie recipes which have a very rich, sweet chocolate flavor. I may try it with less cocoa and milk chocolate chips next time. I know milk chocolate isn't as healthy as semi-sweet or dark chocolate, but I think they'll taste better. Looks like I have nearly an entire pan to eat by myself! I am so sorry these didn't work out for you.. It may not have worked if they used natural cocoa. This recipe calls for baking powder so you should use dutch-processed cocoa powder. The batter smelled divine and they had a very good chocolate taste. But, mine turned out very dry. I wonder if i could add some oil or apple sauce to make them moist? I would try cooking them less. Every oven varies so much if they were dry my first thought is they were over done. Mine looked under cooked at the 30 min mark when I remove them from the oven. I am so glad you were still able to enjoy your brownies and liked the flavor! I just made these and they were perfect! I followed the recipe exactly except I used regular sugar, instead of brown (I was out) and they still turned out great! My 3 and 5 year old boys loved them and so did the picky husband. :) Will be keeping this one for future use. Thanks! I am so thankful they turned out for you! Have a wonderful week! I've been baking these in some form for years. My go-to version is as follows. It's more health-conscious with no added fat; they're also about 1 step removed from being vegan which is helpful with several vegan friends who are pigs for these. Bake 38-42 minutes at 350 in a greased 9x13 pan. I'm trying this unhealthy version just for kicks. thanks~! Thanks for sharing your recipe I will have to try it! Sounds delicious! Have a great week! I have a granddaughter who has food allergies to eggs, dairy, wheat, and soy. She loves chocolate, so I was wondering if you have a brownie version with the black beans but no dairy or flour, or a substitute for the flour that works well? I am thinking the butter could be left out without too much bad affect with the black beans as moisture? But what do I do for flour? Rice, or ??? These turned out very nice. Great, rich flavor. As I was *sampling* the batter :), I kept thinking these have such a rich flavor! Almost as though there someone snuck in a little coffee. Just tried one out of the oven. Really good! My oven tends to overbake a bit, so I cooked at 325 for about 26 minutes. Just right. Thanks for the recipe. We made these yesterday for a birthday party and for today's baby shower. The birthday party was with 11 & 12 year old girls and they were not so keen on the idea, especially since my daughter let the cat out of the bag a little too early. The baby shower, however, was a different story. Everyone complimented them and raved about them! I did read the comments beforehand and increased the amount of sugar (about 1-7/8 cups) and opted to not dust the pan with cocoa powder (and used just shy of the amount called for in the recipe). Our available pan was 9x9 and we baked it for 30 minutes at 350 degrees and then added 10 minutes and turned off the oven for 5 more minutes. That 10 minute segment should have been 5, but they were still quite tasty! Just served these up to my crew of boys.... without mentioning that they contained beans :) They are DEVOURING them, and requesting them as their birthday treat. Score! My only issue is that the beans were hard to get smooth, I ended up melting some of the butter and processing them together so they'd loosen up more. These are the best brownies ever! They are rich and fudgy and just delicious. Everyone is surprised that there are beans in them. Everyone asked me for the recipe. However, I make them dairy free. I use coconut oil instead of butter (and it does give it a bit of a coconut flavor). Also, I use dairy free semi-sweet chocolate chips. Thank you again for the recipe! Lori: any chance you would be willing to share your recipe!!?? I like that you use coconut oil instead! I simply substitute the coconut oil for the butter. I use around 1/3 - 1/2 cup coconut oil. Hope you enjoy! do you have an egg substitute as well? I made these tonight... They were so good! We had them as the brownie part of a brownie sundae for my son's 17th birthday! Thanks so much for the recipe! He's very picky and couldn't believe that they had beans in them! I just finished making these. Used your recipe as a template and tailored it to fit our lifestyle. The changes I made were....coconut oil instead of butter, only 1/2 bittersweet choco chips, 1 C oat flour for 2C AP flour, 2 whole eggs and 2 egg whites, and 2/3 raw honey for sugar. I didn't add any add't chips or nuts, and only baked for 20 min. My BF loved them! and he's a chocoholic!! I noticed the picture shows one teaspoon of vanilla but the recipe says 1 tablespoon. I used 1 tablespoon and it still tasted great. I also used gluten free all purpose flour in place of regular all purpose flour and it works just as well and tastes great! Thanks so much! I'm glad it worked! I used a teaspoons to equal a tablespoon, I probably should notate the picture. At the time I was working on this recipe one of my boys lost my tablespoon playing! I'm glad they turned out great! Yum! New favorite recipe! Rich and fudgy. Not dry at all. Made these and they were amazing. I did cover them pretty good with chocolate frosting but I do that to all brownie recipes. Had to add a tiny bit of water when pureeing the beans but other than that its perfect and my blender is like 10 years old lol it needs a bit of help. No one suspected there was anything amiss with the recipe (like adding anything healthy). Lol my little secret. My husband would probably freak out. He hates beans. Was thinking I should grate in some zucchini so he can see something healthy and doesn't get suspicious. ;) Great blog. Just made these tonight...delicious!!! I modified the recipe slightly by adding vanilla protein powder and ground oats instead of flour, and apple sauce instead of butter and they turned out fabulous :) Also I only baked them for 20 minutes so they were still gooey, I didn't want to dry them out.